Special Note: The Pinniped Cognition and Sensory Systems Lab at UCSC’s LML was the first to ever conduct audiometric research with sea otters. When we think about coastal pollution, we often think of toxic chemicals, plastics, and even harmful algae—but there is also another kind of human-generated pollution that may degrade marine habitats: noise. While coastal environments are naturally noisy places due to surf, wind, weather, and biological sounds, human-generated sound from activities such as construction, transportation, drilling and dredging, and seismic exploration may introduce high levels of noise that are harmful to animals. Noise pollution can alter the behavior of animals, interfere with their acoustic communication and their ability to respond to threats, and at high levels, can even produce temporary or permanent hearing loss. Understanding the potentially harmful effects of noise on marine mammals has been an important research topic for more than a decade—but noise impacts on sea otters still has not been studied. Why not? The sensory biology of sea otters is so poorly understood that scientists have little to go on when it comes to studying the relationship between sea otters and sound. At Long Marine Laboratory, based at UC Santa Cruz, we are working to improve knowledge of the acoustic sense of sea otters. Sea otters are especially interesting with respect to their auditory adaptations. Since otters have only recently made the transition from a terrestrial to an aquatic lifestyle (in evolutionary time, that is) they can provide us with clues about how the demands of amphibious living have shaped perceptual capabilities. We began this research with a basic question: what sounds can sea otters hear above and below the water’s surface? To answer this, we used a few approaches, including recording and studying the sounds otters produce during social interactions, observing how they respond to controlled exposures of different sounds, and studying their auditory anatomy. However, the best method to figure out what sea otters and other animals can hear is to ask them, so we set about training captive sea otters to participate in a hearing test, which we conducted in the specialized acoustic facilities at Long Marine Lab. For this research, sea otters are trained to position themselves at a listening station and report the detection of sounds by touching a paddle to earn a favorite reward like a shrimp or a clam. To test underwater hearing, the otters are trained to dive to a submerged station and perform this task while holding their breath. In air, the otters walk to a special acoustic chamber where they can listen for the sounds in a quiet, anechoic environment. Over time, we can gain a clear understanding of auditory sensitivity by varying the type and level of the sounds, and by running hundreds of trials to ensure that accurate measurements are obtained. This kind of intensive research would not be possible without the support of our undergraduate and graduate student researchers, talented trainers, and outstanding otters. 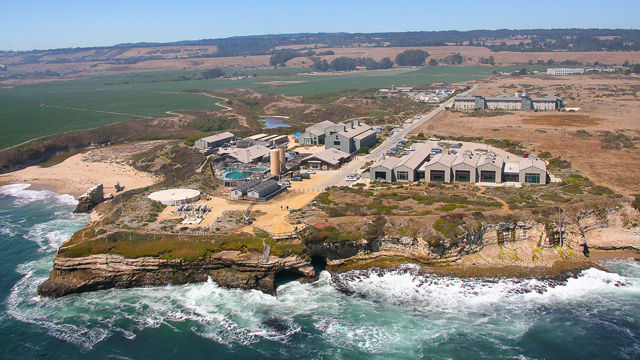 While this project is based at Long Marine Lab, it is a collaborative research effort between our team, the SORAC program at the Monterey Bay Aquarium, and the Aquarium of the Pacific in Long Beach, California. Our hope is that this research will inform conservation and planning efforts for sea otters in coastal habitats that are shared with people, and that it will provide insight into how these unique creatures experience the world around them. In order to learn about what types of sounds sea otters can hear when they are diving under water, researchers at UC Santa Cruz’s Long Marine Laboratory trained a sea otter named Charlie, to participate in an underwater hearing test. In the video above, you will see Charlie’s trainer send him on a dive. Charlie will swim down to the listening station, and will stay on the submerged station by holding on to a handle with his paws. During a “signal” trial, a sound is played. If Charlie detects the sound, he will tell us so by leaving the station, swimming up to the surface, and touching the paddle with his nose. If he answers correctly, you will hear a buzzer, which is a training tool that tells Charlie he got it right, and that a juicy shrimp reward is on its way. During a “control” trial, no sound is played, and Charlie will earn a shrimp by remaining still on the station until the trial is over. This training paradigm allows researchers to ask Charlie the question, “did you hear that?” By adjusting the volume and pitch of the sound, researchers are able to measure how sensitive sea otters are to sounds across their hearing range. Charlie is also trained to participate in the same hearing test on land, so that we can better understand how well sea otters can hear airborne sounds. 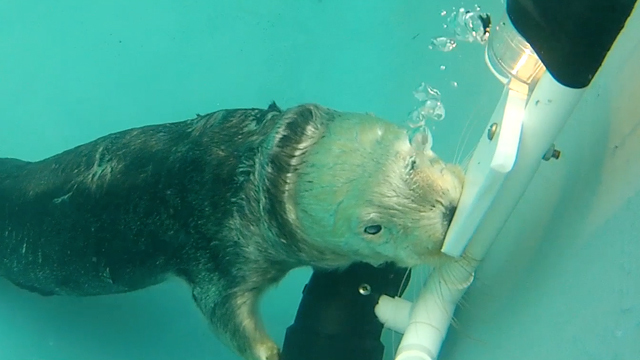 Another great video from the Pinniped Cognition and Sensory Systems Lab!